I’m spending a lot of the time these days at my house and in the car to and from daycare working on counting. It usually goes like this. One, two, eight. Eight is very popular. Sometimes it’s “one, eight, two, eight, seven, mama say twelve now, say twelve.” And so, in this numerological spirit, here’s my counting exercise for the week. A special thank you for Warda for hosting a beautiful lunch in the sun. A chance for good food and good conversation. 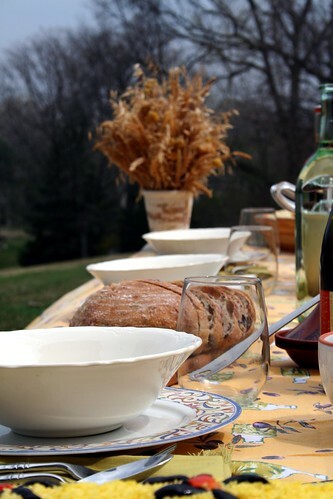 Un remerciement spécial à Warda pour accueillir une belle déjeuner au soleil. Une chance pour la bonne nourriture et la bonne conversation. 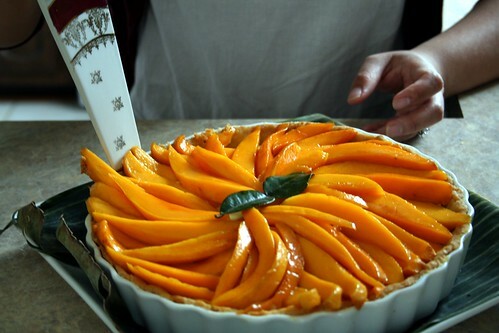 Mango tart, by Christine of Hot, Sour, Salty, Sweet. And Umami. She — I suspect some obsessive tendencies here — complained a lot about the tart cracking. The rest of us ate with great pleasure. Risotto with a tomato-saffron broth, topped with seared scallops. I had never made a tomato broth before. It was a very pleasing process of sauteeing some onions and saffron, adding garlic and tomatoes (both fresh and canned) along with a little fennel seed and orange zest. I let this meld for a few minutes, added a couple of cups of chicken broth and let simmer for half an hour before passing the whole thing through a chinoise. Delicate and flavorful. Pour a nice puddle of it around the risotto and lay some scallops on top. (I wanted monkfish but none had arrived at Monahan’s that day). Fennel rubbed, grilled pork chops (there are some nice Berkshire, heritage chops for sale at Sparrow’s these days) with a lemon-sage vinagrette, courtesy of Bobby Flay (olive oil, lemon juice, garlic, honey, shallot and a bunch of fresh sage given a whirl in the blender), served with braised fennel (suggested by Shana and guided by Molly. Listen well to the recipe’s advice to “gild” the fennel before popping it in the oven; it’s well worth the wait). We started with some individual goat cheese souffles suggested by The Kitchen Diaries and finished with some expensive dark chocolate. Very nice indeed. 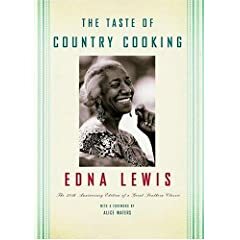 The Taste of Country Cooking: 30th Anniversary Edition . Edna Lewis, Knopf, 2006. I wasn’t expecting to like this. I know Southern cooking is like all authentic American, and I’m as big a proponent of regional foodways as the next earnest food-blogger. But, really, even though I lived for a while in the South, I’ve never quite cottoned to its food. Sure, I can eat fried chicken and biscuits as happily as any other Yankee, but greens in pot liquor (licker? ), grits, and all manner of smothered foods? Pass the baked beans and brown bread, please. But Edna Lewis’ prose is so charming and evocative of a lost time when life was lived close to the seasons and food marked each important event of the year, that I was entirely seduced. I’m threatening my family with fried shad with roe and ham with heavy cream for breakfast. I’m getting out my five gallon pot to raise some biscuit dough over-night. And I am definitely, definitely starting my next Christmas morning with a little snort of bourbon. Chez Panisse Vegetables. Alice L. Waters. William Morrow Cookbooks; 1996. A book that will be helping me make my way through the farm share this year. Just what you would expect. Reverence for the integrity of the ingredients, some simple preparations that are more about basic skills than recipes, and the occasional flight of Chez Panisse fancifulness that makes you think “not in my kitchen, not in this millennium.” Because it showcases vegetables, and vegetables have a somewhat intractable vegetable nature to them, there’s a lot less of those flights than in some of the other C.P. books I’ve looked at. This one works well for the home cook. I think the next few months are going to have some gratins in them. Alice likes gratin. Simple French Food. Richard Olney. Wiley, 1992. Like Chez Panisse Vegetables, this was a recommendation from Matt Morgan. I was prepared to love it and thought I’d be spending some time hunkered down with it in my favorite reading chair and then in the kitchen. My verdict, after two attempts? Unreadable. Uncookable. Not simple. Very French. Nothing that leads me into the recipes. Still. I suspect that I am the problem, not the book. I’m simple-minded. I want stories. I want to become part of a whole world or way of living through my cooking. This books seems much more rigorously about the food. Maybe I’m just not ready for it. Or for lettuce custard. Or for Sauteed Lamb’s Hearts and Liver A La Provencal. Seriously, I do think it’s probably a good book. Just not a very readable one. Not ready for lettuce custard, eh? Make that two of us. Lettuce custard sounds more British than French to me. You know, wrong-headed and inedible. I, apparently, am ready for fennel. Sounds like all I’m eating these days. I love Walters cookbooks. It’s not just a cookbook. It’s her guiding you on each page and with every vegetable. I am so happy to be introduced to your blog. HomelessDave told me about it and I love M & Y (formerly Big 10). Tommy is wonderful! I have a French book to recommend and need to see if I can find it for you. It is fun reading and I think you will like it. I’m not surprised that Matt’s recommendation isn’t what you were looking for. If I can find this book I’ll e mail or come back and make a note. Karen, thanks for the nice note! Looking forward to the recommendation. I feel like the lack of a food French cook book is a real hole in my collection. I have an old Sunset “French Country Cooking” that I actually use with surprising frequency, and I figure someday when I retire I’ll start working my way through Julia Child . . . but I’d like something fresh and workable for right now.